iGEM 2019 is officially underway! Between opening team registration, manufacturing the 2019 DNA Distribution Kits, and preparing new resources for teams, we've been having an extremely busy month here at iGEM Headquarters. Read on to learn about what's new this month. iGEM 2019 is officially underway! Between opening team registration, manufacturing the 2019 DNA Distribution Kits, and preparing new resources for teams, we've had an extremely busy month here at iGEM Headquarters. Read on to learn about what's new this month. - Regular registration closes in 2 weeks! Reminder: Regular Team Registration - 2 Weeks Left! 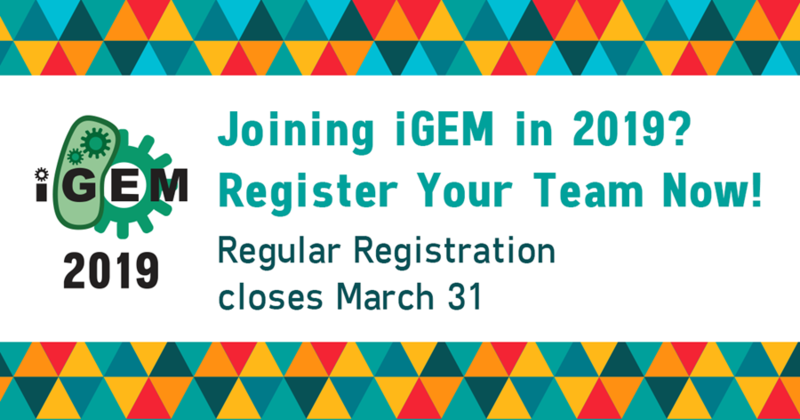 Be a part of iGEM 2019 and register your team today. Regular registration is open for two more weeks. Register and pay before March 31, 2019 at 11:59PM EDT to avoid the $500 late registration fee. What is the most popular competition track? How many teams work in chassis other than E. coli? What are the most important research trends in iGEM? Get answers to these questions and many more in the newly published iGEM 2018 Annual Report. The report provides a review of the accomplishments of iGEM teams in 2018 and explores project trends. It also highlights the important work of iGEM's committees, ambassadors, and delegates in contributing to the success of iGEM in 2018. If you have colleagues who you think should apply, please pass on this information! The iGEM Ambassadors represent the iGEM community and promote Synthetic Biology in their respective regions. They are a diverse team of regional leaders who have experienced the iGEM adventure and now work together to find and connect iGEMers, promote initiatives to expand iGEM and collaborate with local stakeholders to boost cooperation across their community.